ABSTRACT: Self-medication is global problem but in developing regions, where drugs are available to customers easily it arises greater risks and challenges. Peshawar and Mardan are two big and heavily inhibited cities of a developing country, Pakistan hence in this study we aim to find the level of self-medication and general knowledge about antibiotics of the people in these two cities. We conducted our study on 500 participants from these two cities (250 from each) through a simple questionnaire. Our results confirmed that 78% of participants were using self-medication we also report that 45.2% of the participants prefer self-medication to a physician prescription. Our results also showed that 25.6% of the participants never check the expiry date on the antibiotics they use during self-medication. We also found that 63.6% of the participants believed that they know what type of antibiotic to take for which medical complications however in contrast 34.4% of participant reported that antibiotics could be used in dengue fever. We conclude that the knowledge and perception of inhabitants in Peshawar and Mardan needs to be improved to reduce the problem of self-medication in these big cities. INTRODUCTION: Self-medication with antibiotics is an act of using antibiotics for symptoms and diseases that are diagnosed by oneself with an aim of eradicating the disease or its symptoms 1, 2. Other things that are in common observation and that make up the self-medications list are; utilizing medicines of people you know, using medicine already present at home (leftover medicine from previous illness), acquiring medicines without physician prescription and using an old prescription of a doctor for getting medicines without physician recommendation 3. This practice of self-medication has now become a global problem however in developing countries like Pakistan this problem is in its worse form because of poor economic condition of its inhabitants 3. Other developing countries from where self-medication problem has been reported include Trinidad and Tobago, Sudan and Brazil 1-2, 4-5. However developed countries are also not exempted from the menses of this problem and in countries like USA, Russia, Spain, Greece and Israel, several studies have reported problems because of it 6-11. From perspective of the user of self-medication, these antibiotics may work in eradicating his disease symptoms however scientifically it is proved that if he takes the wrong antibiotics or takes improper dosage of the antibiotic then he is liable for side effects and the pathogen may get resistant and more pathogenic to the patient body 14-15. Furthermore studies in developed countries like the United States and Europe have shown that the majority of people who use self-medications for upper respiratory problems are usually suffering for viral infections which means that the antibiotics that they take have no benefit to the disease curing but only increase the selection of many antibiotic resistant pathogens in their bodies which ultimately worse their upper respiratory track problem 16-17. The abundance of pharmaceutical ads on electronic and print media has also contributed to increase in self-medications. In a recent study it was shown that the majority of college students had used one or more drugs after getting inspired by their advertisement adds 18. In Peshawar (provincial capital of Khyber pukhtoonkhwa, Pakistan) and Mardan (second largest city of the province) where selling of antibiotics to customers by the medical stores is a common practice, the problem of self-mediation is in its worst form 19. Lack of education, knowledge of antibiotics, poor economic conditions could be some key factors that could contribute to misuse of antibiotics and self-medication in these cities. However in spite of this daily life observation about antibiotic self-medication no scientific study has yet been done to scientifically illustrate this problem in Mardan, and only one study for Peshawar in 2010, hence with this study we aim to solve this problem by addressing the attitude, knowledge and perception of Peshawar and Mardan inhabitants towards self-medication. METHODOLOGY: The method that was used for obtaining the results was based on a survey. We used a questionnaire that was written in simple and understandable manner and asked our participants around the city to fill them. The participants were selected at random and were informed about the purpose of the study and only after their consent were the questionnaire given to them for answering. Total of 500 participants participated in this study among which 250 were from Peshawar and 250 from Mardan. RESULTS: Among the participants that took part in our study the majority were in between age 20-30 (age group distribution is shown in figure 1). The results of this study are to say the least, alarming. We found that 78% of the participants use antibiotics without physician prescription while 31.2 % reported that they actually prefer self-medication that going for physician advice. Participants (47.2) also reported that they only go for chemist advice when it comes to antibiotics and that they don’t consult a physician for prescription. Furthermore they (31.2) reported that while performing self-medication their favorite medicine is an antibiotic. These finding are illustrated in figure 1. 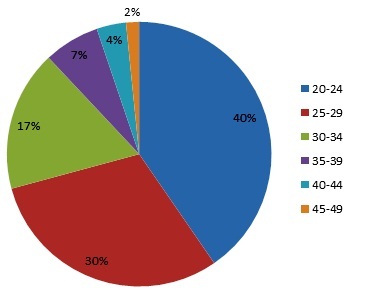 FIGURE 1: this figure illustrates the percentage of different age groups of the survey participants. among which the most abundant with 40.4% is age group from 20-24 followed closely with 30.4% by age group of 25-29. The knowledge of participants for antibiotics side effects knowledge was also checked and the results are illustrated in figure 2. It can be seen from the figure that a high percentage of participants (81.6%) reported that they were aware of the allergic reactions that could be caused due to antibiotics. Additionally 33.2% participants reported that they had suffered any allergic reaction due to antibiotic in their life time (figure 3). When asked if they thought self-medication was safe surprisingly 29.2% in spite of majority knowing its possible allergic reactions reported said “yes”. 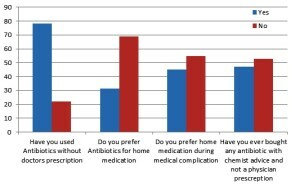 FIGURE 2: It shows that the percentage of people using antibiotic without doctor prescription was very high (78%), percentage of participants who prefer antibiotics for home medications was 31.2%, those who agreed that they prefer home medication was 45.2% while the percentage of participants following only chemist advice was fairly less i.e. 47.2%. Furthermore 28% reported that if they thought their condition is similar to a patient they knew they would have no hesitation in using his/her antibiotics. Furthermore we also checked the source of attraction for antibiotic usage. We found that 21.2% of our participants used antibiotics because of watching these antibiotics ads. We also found that 28.4% of the participants used antibiotics when they were referred to them by other people they knew. Additionally we found that 48% of participants knew that use of particular antibiotic should be particular for particular condition. These results are shown in figure 4. 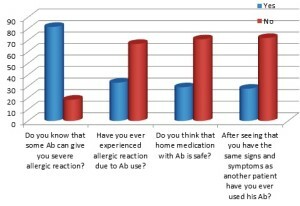 FIGURE 3: Shows that the percentage of participants who are aware of severe allergic reaction due to Ab is high i.e. 81.6%. 33.2% Participants also reported that they had suffered allergic reaction, 29.2% reported that home medication is safe, while 28% reported that they had used antibiotics of a patient who they thought had similar condition to their own. 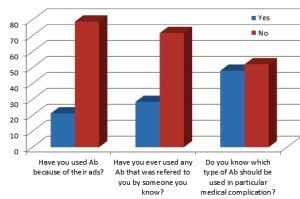 FIGURE 4: This figure shows that 21.2% of participants had used antibiotics after getting inspired from their commercial advertisements, 28.4% reported that they had used antibiotics after they were referred by people they knew, while 48% reported that they knew which antibiotic to use in a particular medical condition. When we investigated the attitude of participants towards checking the expiry date of the antibiotics we were surprised to know that 14.8% of them never check this date while buying antibiotics while 25.6% reported that during self-medication they don’t check this date. These results are illustrated in figure 5 however this piece of information indicates a major problem that could be the cause of allergic reactions in this provincial capital city, Peshawar and in Mardan. FIGURE 5: show that 85.2% of participants check antibiotics expiry date before purchasing them. It also shows that about 74.4% of them also check the expiry date before home medication. 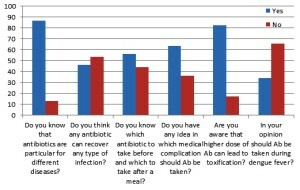 We also checked knowledge of participants in accordance with usage of antibiotics (illustrated in figure 6). Our result indicated that as high as 22% of them didn’t knew that wrong antibiotics can lead to antibiotic resistant pathogens, while 73.2% reported to have knowledge that use of antibiotic is also to an extent dependent on age factor. Furthermore, wondering 39.2 % participants of the survey didn’t have any idea of the crucial reactions of antibiotics. 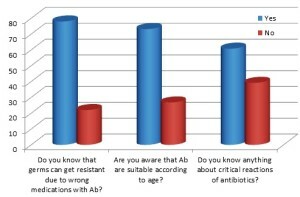 FIGURE 6: It shows that 78% of participants knew that germs can get resistant because of using wrong antibiotics, 73.2% reported that antibiotics use depends on the age factor while 60.8% reported that they have knowledge about the critical reactions of antibiotics. When we asked the participants if they knew antibiotics were specific for particular diseases 86.6% of them reported “Yes”. However 46.4% reported that antibiotics could recover any type of infection while 56% also reported that they knew if an antibiotic has to be taken before or after a meal. Furthermore 63.6% reported that they knew which antibiotic to take in which medical condition, 82.8% also reported that if we use higher dosage of antibiotic then it could lead to toxifiation of the body while when asked if antibiotics should be used during dengue fever 34.4% participants reported “Yes”. These above mentioned results are illustrated in figure 7. FIGURE 7: It illustrates that a high percentage i.e. 86.8% of participants knew that antibiotics are particular for particular diseases, 46.4% reported that they thought that any antibiotic could recover any type of infection, 56% reported the knowledge of antibiotics dose before or after a meal, 63.6% reported that they had idea of which medical complication require which antibiotics, 82.8% reported that higher dosage of antibiotics could lead to toxification, while 34.4% participants reported that antibiotics should be taken for dengue fever. DISCUSSION: In big cities like Peshawar, the provincial capital and Mardan, where every basic and most advance healthcare facilities are presents the percentage (78%) of people using self-medication was surprising and alarming. This finding indicates, for Peshawar city, a nine percent increase from 69% in 2010 to 78% in 2012 20. Furthermore 45.2% of the participants reported that they prefer self-medication to a physician prescription which is a matter of concern. We also report that general knowledge about antibiotic side effects was common to the majority of population. Additionally we also found that as high as 25.6% while performing never even bother to check on the expiry date of the antibiotics while 63.6% of the city inhabitants reported that they believe that they know what type of antibiotic to take for which medical complications. However to negate their claim 34.4% of participants wrongly reported that they antibiotics could be used in dengue fever. Hence we conclude that the knowledge of the inhabitants of Peshawar and Mardan is not good enough and need further education on antibiotics and its usage. We also conclude that the perception and attitude of people in these cities are not accurate enough and needs positive changing through education about healthcare seminars or any other means. Awad, A., Eltayeb, I., Matowe, L., Thalib, L. Self-medication with antibiotics and antimalarials in the community of Khartoum State, Sudan. J Pharm Pharm Sci. 2005; 8:326-31. Parimi, N., Pinto, PLM., Prabhakar, P. Caregivers’ practices, knowledge and beliefs of antibiotics in Paediatric upper respiratory tract infections in Trinidad and Tobago: a cross-sectional study. BMC Fam Pract 2004; 5:28. Sturm, AW., van der Pol, R., Smits, AJ., van Hellemondt, FM., Mouton, SW., Jamil, B., et al. Over-the counter availability of antimicrobial agents, self-medication and patterns of resistance in Karachi, Pakistan. J Antimicrob Chemother. 1997; 39:543–7. Servidoni, AB., Coelho, L., Navarro, ML., Gobbi de Ávila, F., Mezzalira, R. Self-medication profile of ENT patients. Rev Bras Otorrinolaringol (Engl Ed) 2006; 72:83–8. Volpato, DE., de Souza, BV., Dalla Rosa, LG., Melo, LH., Stabel Daudt, CA., Deboni, L. Use of antibiotics without medical prescription. Braz J Infect Dis 2005; 9:288–91. Vaananen, MH., Pietila, K., Airaksinen, M. Self-medication with antibiotic — does it really happen in Europe? Health Polic 2006; 77:166–71. Mitsi, G., Jelastopulu, E., Basiaris, H. Patterns of antibiotic use among adults and parents in the community: a questionnairebased survey in a Greek urban population. Int J Antimicrob Agents 2005; 25:439–43. Stratchounski, LS., Andreeva, IV., Ratchina, SA., Galkin, DV., Petrotchenkova, NA., Demin, AA., et al. The inventory of antibiotics in Russian home medicine cabinets. Clin Infect Dis 2003; 37:498–505. Richman, PB., Garra, G., Eskin, B., Nashed, AH., Cody, R. Oral antibiotic use without consulting a physician: a survey of ED patients. Am J Emerg Med 2001; 19:57–60. Raz, R., Edelstein, H., Grigoryan, L. Self-medication with antibiotics by a population in northern Israel. Isr Med Assoc J 2005; 7:722–5. Filho, L., Antonio, I., Lima-Costa, MF. Uchoa E. Bambui Project: a qualitative approach to self-medication. Cad Saude Publica 2004; 20: 1661-9. Thomas, JK., Forrest, A., Bhavnani, SM., et al. Pharmacodynamic evaluation of factors associated with the development of bacterial resistance in acutely ill patients during therapy. Antimicrob Agents Chemother 1998; 42: 521–7. Guillemot, D., Carbon, C., Balkau, B., et al. Low dosage and long treatment duration of b-lactam: risk factors for carriage of penicillinresistant Streptococcus pneumoniae. JAMA 1998; 279: 365–70. 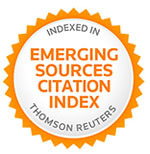 Richman, PB., Garra, G., Eskin, B., et al. Oral antibiotic use without consulting a physician: a survey of ED patients. Am J Emerg Med 2001; 19: 57–60. Grigoryan, L., Haaijer-Ruskamp, FM., Burgerhof, JG., et al. Selfmedication with antimicrobial drugs in Europe. Emerg Infect Dis 2006; 12: 452–9. Burak, LJ., Damico, A. College students' use of widely advertised medications. J Am Coll Health 2000; 49: 118-21. Chang, FR., Trivedi, PK. Economics of self-medication: theory and evidence. Health Econ 2003; 12: 721-39. Sheraz, JK., Amanullah, Shimal, K., Nazeer, S. self-medication with antibiotics in urban areas of peshawar. Gomal Journal of Medical Sciences 2011; 9(1): 19-22. Ahmad H, Sherwani SK, Nisar W, Ahmad T, Shah S, Ahmad W and Ahmad Z: Self-medication with Antibiotics: General perspective among people in Peshawar and Mardan (two most populated cities of Khyber Pukhtoonkhwa-Pakistan). 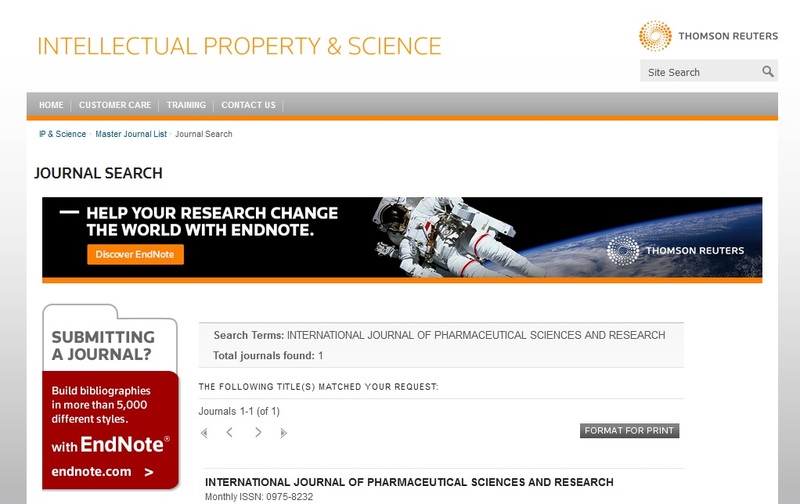 Int J Pharm Sci Res 2013; 4(5); 1809-1814.